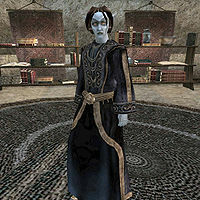 Mehra Milo is a Dunmer priestess who is a member of the Dissident Priests of the Tribunal Temple, currently serving in Vivec, where she can be found in the Library of Vivec in the Temple Canton. She is your first contact with the group, and after rescuing her from the Ministry of Truth, she will introduce you to the rest of them, where they are operating out of Holamayan Monastery on an island off Azura's Coast. "Yes. I'm Mehra Milo, a librarian for the Hall of Wisdom. Can I tell you about our collection?" "Follow me to the back of the library. We can talk there." "Go ahead. I'm afraid I don't know anything about a Sixth House cult, but I can tell you about the Nerevarine Cult." "As I said, get Caius a copy of 'Progress of Truth' and that should tell him things he needs to know about the Nerevarine cult. Is there anything else you want to ask me about?" "Do you have the Divine Intervention scrolls? I have an escape plan." "I'll meet you at Holamayan. Good luck. When we get there, talk to Gilvas Barelo. He should be able to help you with the Lost Prophecies you seek." "Thank you, %PCName, for rescuing me. Now I'll stay here at Holamayan with Master Barelo and assist him with the monastery's library." '"Caius is a dear friend. Like me, he admires the best traditions of the Temple, charity for the poor, education for the ignorant, protection for the weak. He is a Westerner, bur he has come to love our land and our people. But like me, he distrusts the arbitrary power of the Ordinators, and like the Dissident priests, he suspects the Temple is hiding something. He serves the Emperor, but he also loves Morrowind, and he sees the failing virtues of the Temple as a threat to Morrowind's political stability." "Caius has gone back to the Imperial City? He says he's been recalled? I wonder. I never know what he's thinking. I think he's involved in something secret, something dangerous. I was hoping he might help us. Now he's gone. I don't know what to think." Dissident Priests: "The Dissident priests dispute Temple doctrine, and are outlawed and persecuted by the Temple. Ordinators arrest and imprison heretics, and the Empire cannot interfere. 'Progress of Truth' lists their beliefs. In brief, they challenge the purity and divinity of the Tribunal, suggesting their powers are sorcerous, not divine, and perhaps akin to the powers of Dagoth Ur. they also condemn the arbitrary power of the Ordinators, and accuse the Temple hierarchy of self-interest and corruption." disturbing dreams: "That means nothing to me. Perhaps you wouldn't know, but the Temple regards disturbing dreams as a sign of soul sickness -- a sign that the mind is deranged by impure impulses and dangerous feelings. The Ashlanders have many superstitions about dreams, but they have superstitions about everything." "I left a note for you that told you I needed Divine Intervention scrolls. I need at least one for my escape plan. If you haven't got one, you'll have to go get me one." [Disposition +40. Scroll of Divine Intervention has been removed from your inventory.] When you get out of here, look for a woman named Blatta Hateria on the East Docks of Ebonheart. Tell her I sent you, and that you want to 'go fishing.' She'll bring you to Holamayan by boat. I'll meet you there, and we'll get the lost prophecies from Gilvas Barelo, the leader of the Dissident priests. And magic conceals the Holamayan entrance -- speak to Vevrana Aryon, a monk at the dock at Holamayan, about the hidden entrance." "I have the scroll. I'll meet you at Holamayan. Goodbye, and good luck." "Of course, normally I only use Almsivi Intervention scrolls. But for my escape from the Ministry of Truth, a Divine Intervention scroll was just what I needed." "We can't talk now, but in the 'Apographa' -- the hidden teachings of the Temple -- there are several extensive references to 'lost prophecies' -- prophecies no longer current among the Ashlanders, but recorded by earlier Temple pilgrims and scholars. And I think you'll find what you're looking for in the libraries of Holamayan." "The Temple worships Nerevar as a saint and hero, but prophecis of his reincarnation are punished as wicked heresy. The Nerevarine cult claims the Tribunal are false gods, hence the Temple's persecution of the Nerevarine cult. A group called the Dissident Priests disputes Temple doctrine on the Nerevarine prophecies. The proscribed book 'Progress of Truth' describes heir beliefs. Get a copy of 'Progress of Truth' for Caius Cosades. That will tell him things he needs to know about the Nerevarine cult." "As I said, the Dissident priests have a book called 'Progress of Truth' which gives their views on the beliefs of the Nerevarine cult." Nerevarine prophecies: "The Ashlanders have a mystical tradition of interpreting dreams and visions as prophecies. These prophecies are recorded in verse, and may be lost or garbled over the generations. But the Dissident Priests have collected many ancient prophecies of the Nerevarine, many of which they believe to be genuine. Collectively these are called the Lost Prophecies of the Incarnate. One of the sacred missions of the Dissident Priests is the collection and study of these prophecies." our collection: "Volumes of general interest can be found in our Main Reading Room. Other collections are found in rooms adjoining the Main Reading Room. Our special collections include Western Studies -- the Empire and the provinces -- history, arts and crafts, law and custom, and geography. The reserve room contains works on heathen cults. These volumes are not for sale, of course, and may not leave these rooms." persecuted by the Temple: "Why does the Temple persecute the Dissident Priests? Because attacks on the Temple weaken the faith, and leave the people defenseless against the influence of Dagoth Ur. Faith is what strengthens the will of the believer against Dagoth Ur's lies. Faith is the source of the divine power that sustains the Tribunal in their battle with Dagoth Ur. Since the Empire, some Dunmer have turned away from the Temple; that's why Dagoth Ur grows stronger, why blight storms and monsters threaten the land." persecution of the Nerevarine: "It's an Ashlander cult -- primitive superstition, says the Temple. Nerevarines say the Tribunal are false gods. I've never understood why the Temple wastes so much energy on them. The faithful cannot be shaken by such attacks, and the Ashlanders are just ignorant savages. But since the submission of the Temple to the Empire, and the erosion of faith among the Dunmer, the militant wing of the Temple is increasingly fierce in its attacks on heretics and heathens." Progress of Truth: "This book lists the disputes of the Dissident priests with Tribunal Temple doctrines. The Temple has outlawed the sale or possession of the book, so it will be hard to find. We have a copy here, but I fear I'm being watched by Ordinators here. A safer plan would be to search local booksellers. Some booksellers ignore Temple bans on outlawed books for profits or for principles." Soul sickness: "Soul sickness is called "madness" or "insanity" in the Empire. Signs of soul sickness are strange dreams, uncontrollable impulses, and cruel and evil deeds. Madness is not a disease, as Westerners believe, for if it were, it might be cured by blessings and healers. Soul sickness is a curse of Dagoth Ur, who sends dark dreams to attack the weak of faith in their sleep. Those strong in faith can resist; those weak in faith must seek counsel from the Temple." This page was last modified on 15 July 2018, at 08:12.